Lauren Bacall's life has been widely covered by the media ever since her screen debut in To Have and Have Not with Humphrey Bogart in 1944. This volume is a comprehensive critical guide to all aspects of Miss Bacall's career in film, radio, television and stage. 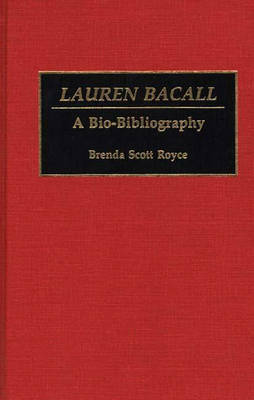 Her personal life, no less extraordinary with marriages to Bogart and Jason Robards, is documented in a biographical essay. This volume provides cast and production credits, plot synopsis, review excerpts of all film, radio and stage appearances, with a detailed, annotated bibliography for additional research. Lauren Bacall is a living screen legend. She has excelled in all aspects of show business from movies to her first love, the Broadway stage. Her romance with Bogie thrilled the nation. Dubbed The Look by the press, her every move was well-recorded in the papers and fan magazines. Though she was more famous as Mrs. Bogart, she continued to act in films. After Bogart's death in 1957, Bacall put their two children and her work above all else. Standing on her own merits, rather than as half of a famous team, she achieved critical acclaim on Broadway in Applause and Woman of the Year.